Africa Directions Theatre Group is well known for being some of Zambia’s best young performers. This group of young people is incredibly gifted and dedicated to perfecting their art, coming to the centre twice a day to rehearse plays, sing, and do exercises to stay fit. Twice a week, they conduct outreaches in the community or at schools to sensitise people on issues such as drug abuse, family planning, HIV/AIDS, malaria, etc. and to encourage them to visit AD’s centers. Theatre for community action has always been one of AD’s most important strategies. Dramas resonate with people of all ages and is a very popular form of ‘information through entertainment’. As soon as they start beating the drums, huge crowds gather around creating the perfect forum to teach whilst people are having a good time. They provide a unique and dynamic approach to spreading messages of HIV/AIDS prevention and behavior change. Having begun in 2000, the group has evolved with time and experience. The group travels both locally and abroad, having been selected to go to countries like Botswana, Zimbabwe, South Africa, Swaziland, Tanzania and Ethiopia for participation in international festivals. 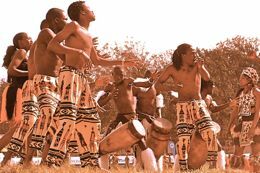 Their unique and artistic style has developed in part from combining traditional Zambian dances with elements they have learned from other cultures. AD’s group is hired by NGOs, businesses, and government institutions for functions, allowing its members to earn a living. Many use their allowance to pay school fees or supplementing their families income. The group continues to bring in new talent - welcoming anyone who is willing to give it their best effort - training and mentoring them until they reach a professional level. AD has produced many actors and actresses that are now working on local soaps like Banja and Brothers, etc. and others have been offered jobs by the government of Zambia.